This water mite was easier to photograph, because it seemed to have died or run out of air in some way. So it held still for the camera. 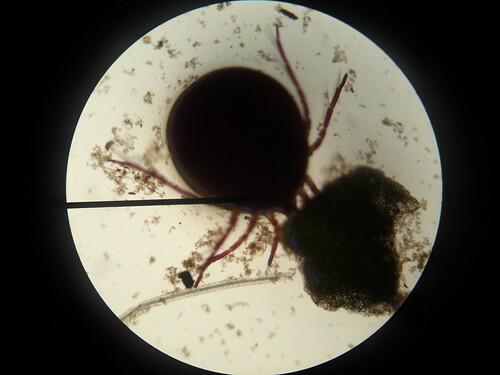 Even are we accidentally popped it while getting it onto a microscope slide, we still got good photos. I'm not sure what the hairs are for, but they might be used as swimming paddles along with its legs. 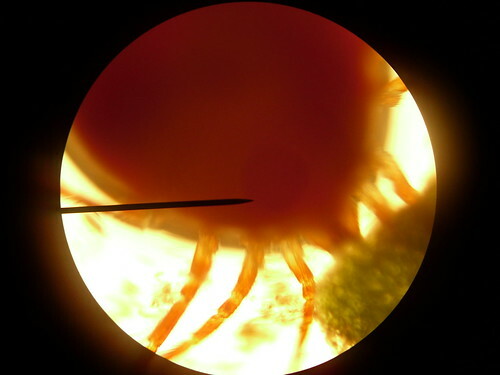 Today I looked at a red water mite through a microscope in Mrs. Loher's room. I got it from the tank of pond water with an eye dropper. 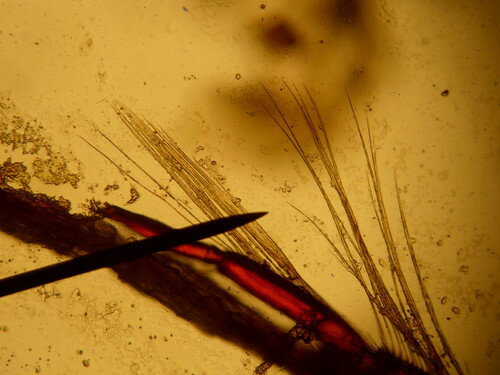 When I looked at it through the microscope, I noticed that it had long hairs to help it swim on three out of four of its pairs of legs. It has legs like a backswimmer water bug or like the bigger water bug that Mrs. Loher had last week. It had a redish brown body, two mouthparts, and eight hairy legs. The back six legs have long hairs pointing backwards. I could see a rather large darker blotch in the middle and some little darker spots, but didn't have a clear view of its internal organs. I think that maybe it can become a pest if areas become overpopulated with them, but in general their role in the ecology might be (I'm not sure if I'm right) to clean up plant and animal matter, or they may be parasites, since they look like ticks with long hairs on their legs. It was kind of easy to see because it had the red color to it. Sometimes animals have the color red or orange as a warning color, for example red efts, which are poisonous. I don't know if these are poisonous or not. At home, we looked again at the picture of the fruit fly that we took the other day where it seemed like we could see its internal organs. 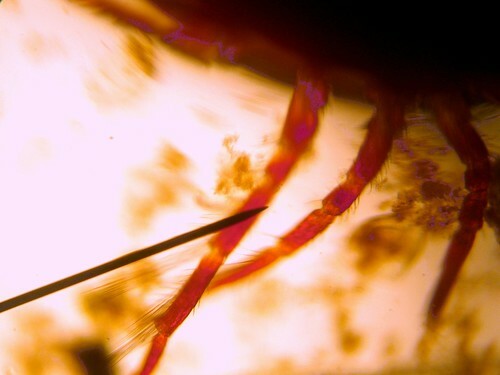 What I thought we its internal organs under the microscope now look to me like a parasite living inside the fruit fly.